We always keep in our stock most popular sawing blades in order to offer a fast delivery. You can see precise delivery terms for each product. Also we can offer other types of cutting and grinding discs. 1. The rake angle – cut quality, feed and cutting force depends on this angle. 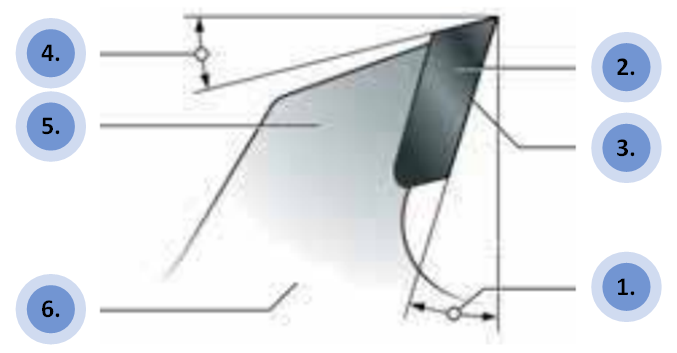 This angle always correlates with entry and exit angles to the workpiece. 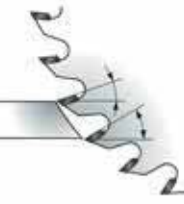 Rake angle depends on material to be processed (decreasing rake angle – soft and hard wood, chip materials, non-ferrous metals) and cut quality on one or both workpiece sides. 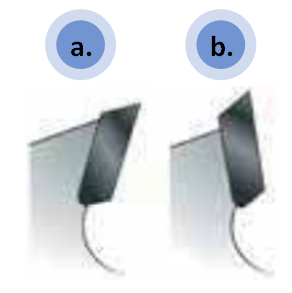 a) Positive rake angle – fast and easy cutting; cutting force in the direction of workbench (ideal for hand held saws); cut quality good in the bottom, poor in the upper side. b) Negative rake angel – more power required for cutting; cutting force in the direction of workpiece (ideal for mitre saws); cut quality good in the upper side, poor in the bottom of the workpiece. 4. Clearance angle – this angle influences the chip size. 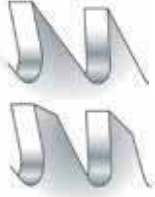 In case the clearance angle is too low – chip removal by next tooth is not possible (cutting will stop). The bigger clearance angle – bigger chip and faster feeding is possible. Saw blade thickness – thick blades are more stable and suits for precise cuts in thick materials using powerful machines. Thin blades suits for thin material cutting using less power. Therefore thin blades are ideal for cordless tools. Very clean cut in soft and hard wood, wood-fiber, laminate and plastics. For use in mitre saws. Perfect for fast and coarse lengthwise cuts in solid wood. Very clean cut in plastics, aluminum, copper, brass, coated chipboards and MDF boards, other wooden materials. Ideal for construction wood, plywood boards (also with nails and concrete residues), chipboards. For use in table saws and powerful hand saws. Perfect for boards with coating on both sides – very precise and clean cut. Usually used with log cutting saws, high performance table saws and circular saws.